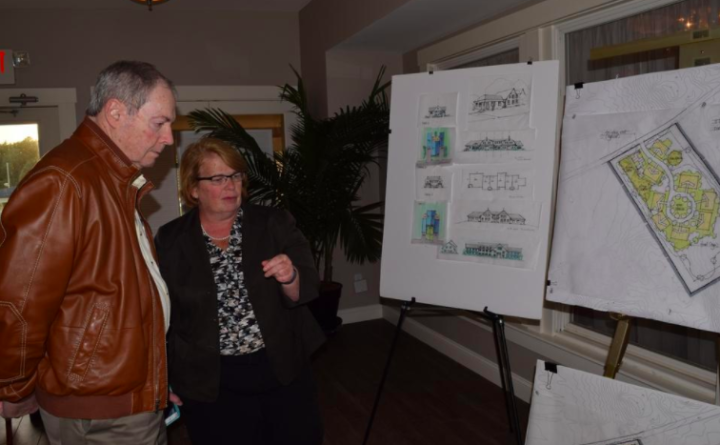 Kennebunkport selectman Pat Briggs, left, and Town Manager Laurie Smith look over a housing project proposal in this 2016 York County Coast Star file photo. The selectmen are now asking voters to approve $10 million in funding in an attempt to purchase 85 acres of property across from the Village Fire Station from a development group before it can build a subdivision there. KENNEBUNKPORT, Maine — The Board of Selectmen is asking residents to approve $10 million dollars in a last ditch attempt to buy an 85-acre parcel of land across from the Village Fire Station and secure it for the town, before the current owner moves forward with a planned multi-phased subdivision. The land, off North Street, was purchased in January of 2006 from the Frink family by CDMK, LLC, a Massachusetts based development group, and approved that same year for a phased subdivision of 80 dwelling units — one dozen in a multiplex building, and the rest of the units in duplexes. The town had the opportunity to purchase the land then, but passed on it, something several members of the Board of Selectmen said was a mistake during Tuesday night’s joint meeting with the town Budget Board. A special town meeting has been scheduled for 6 p.m. next Wednesday, Sept. 19 at the Village Fire Station on North Street. The full warrant article can be read on the town’s website at www.kennebunkportme.gov. The development project, named Olde Port Village, has hit numerous snags over the past 12 years, including last year when a mortgage foreclosure on the property loomed and the town asked voters to approve up to $5 million to bid at a foreclosure auction. Foreclosure was avoided by developer Thomas Macone, and the auction never happened. Macone said last fall that he intended to continue with the permitting and site work. Town Manager Laurie Smith told the selectmen and Budget Board members Tuesday that a number of people came to her last fall and expressed interest in the town owning the property if it ever became available again. Smith met with Macone a few weeks ago to review the bonding requirements, which need to be met before the final stage of development begins. She asked him about the opportunity for the town to purchase the property, and Macone said his intent is to move forward with the project, which would begin construction on the condominiums shortly. “My sense is he’s very close to where he needs to be, and we would be seeing bulldozers and heavy equipment in there soon,” Town Planner Werner Gilliam told both boards Tuesday. Smith said the town did extensive research to determine what would be a fair market price to purchase the 85-acre parcel, knowing that other private developers could be making the same move to purchase it from CDMK. “We are a public entity, so we have to do everything out in the open. This is the town’s last opportunity to partake in a buying opportunity,” Smith said. Selectman Stuart Barwise said Tuesday that the town has done its homework on the price. While $10 million dollars is a hefty price tag, Barwise noted that the location of the property, with access to downtown, and to all of the municipal infrastructure, is a rarity in Kennebunkport. Selectman Pat Briggs said that it was a key opportunity for the townspeople to control what goes into such a central hub of a location. Briggs said voters supported the $5 million last fall because if the town owns the property it will prevent someone from developing the parcel in a way that would not be in the best interest of the town. “We can keep the town’s needs in mind. Town hall has outgrown its use at its current location. There are a number of possibilities that would benefit our town, and this is our last shot at this,” he said. Barwise said he was strongly in favor of the town trying to purchase the property. “I think this is a historic opportunity that we would be crazy not to give careful attention to. There aren’t many places in Kennebunkport that have access to infrastructure and resources like this one does. It is truly unique. From the moment we passed on it 12 years ago to today we have had people tell us we missed an opportunity. They (CDMK) haven’t offered it for sale, but we want to make a run at it, and hopefully we will be successful. We have a chance to correct what many view as an oversight of the past. I’m coming out strongly in favor of doing this,” Barwise said. Comments from both the select and budget boards were universally in favor of putting the question before voters next week. Budget Board member Kai Leffler said she was very much in favor of approving the $10 million, noting that opportunities like this are very rare. Smith said if townspeople support this next week, it would authorize her to move forward with an offer to CDMK. If successful, the $10 million would be bonded over a 20-year period. As for the questions around plans for the property, Smith said her simple answer is, there is no plan. “The property is valuable because of its size and location. People are concerned about development pressures, and housing needs, this could be an opportunity to plan something that integrates well and sets us in a new direction for the future,” she said. “This would be one of the best investments the town could make,” Selectman Allen Daggett said. Residents can vote on the measure during the special town meeting next Wednesday, Sept. 19 at 6 p.m. at the Village Fire Station on North Street.